Our Pick n Mix Stand is a perfect attraction for corporate events, any type of reception, and retro theme events. Our Pick n Mix stand is a large commercial size stand suitable for events with 150+ guests. It's supplied fully stocked with upto twenty compartments full of everyones favourite pick n mix sweets. All the traditional Pick n Mix sweet bags your guests will need, together with plastic scoops for hygenic serving, are all included. At the end of the event any remaining sweets are yours to keep! 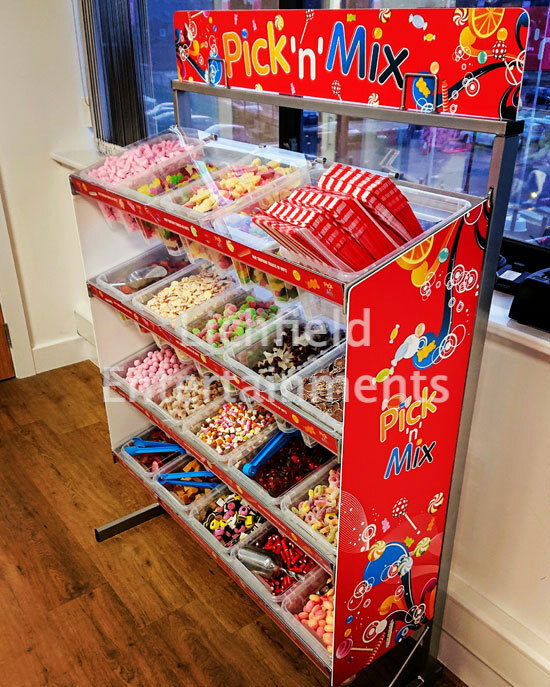 If you have any queries, questions, or would like to hire the large Pick n Mix Stand please click here to enquire and we will do all we can to help.